“I love spending my entire Saturday cleaning,” said no one ever. Which is why we rely on these genius tips and tricks to get our homes sparkling(ish) faster than you can belt out your best rendition of “Smelly Cat.” Because we’ve got better things to do (like rewatch the entire season three of Friends on Netflix). To nix any bad odors and keep blades sharp, simply toss a few lemon wedges and a couple of ice cubes into your garbage disposal, turn on the cold water and let it run. Easy-peasy lemon-squeezy. Keep clutter at bay with a few strategically placed (and stylish) baskets in every room of the house. Let this be where all the magazines, toys, and other random household items end up. Out of sight, out of mind. Group all utensils together in the dishwasher by type (i.e., all the spoons together, then the knives, then the forks). Trust me – it will make unloading the machine a total breeze. 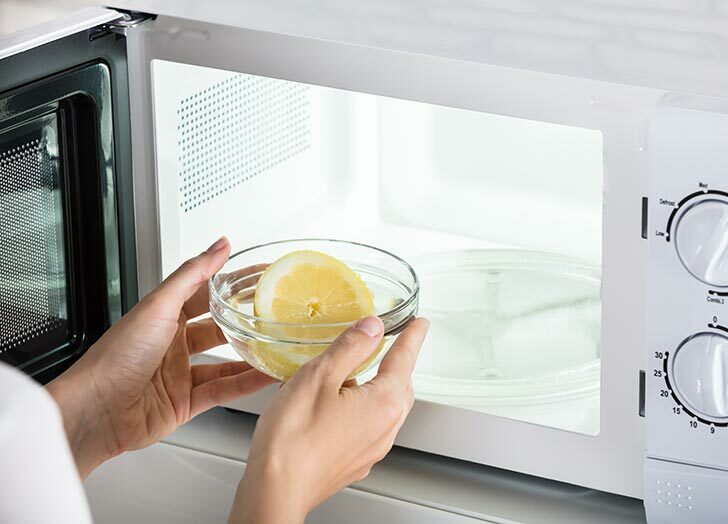 Fill a microwave-safe bowl with half a cup of water and the juice of one lemon. Microwave for three minutes, then let stand with the door closed for five more so the steam can work its magic. Remove the bowl, then use a damp cloth or sponge to easily wipe away any stains or leftover food gunk. Have guests coming over in ten minutes? Walk around each room of your home with a couple of tote bags to collect all the random stuff off the floor, using a different bag for each room. Then bring each bag to its room and put everything away later. If you’re only using your dishwasher for crusty plates and dirty cups, then you’re really not taking full advantage of this glorious machine. Bath toys, plastic hairbrushes, Legos, contact cases, fridge shelves, pet dishes, and non-wooden gardening tools can all benefit from a spin in the top rack. Psst… you’re using trash bags all wrong. To save yourself time and effort, stash extra bags in the bottom of the can. That way, the next time you fill a bag, you can simply lift it up out of the can, grab a fresh one from the bottom, and you’re in business. After using, rinse your blender with warm water. Then, fill it up halfway with more warm water and a few drops of dishwashing liquid. Blitz for ten seconds, empty, and rinse. Good as new. And give your walls a quick wipe-down after every shower to prevent limescale buildup. It will help to catch any food drips, and it’s way easier to toss out and replace foil than scrub the oven. Use an old pillowcase and place over each fan blade, then slide it off, grabbing dust and dirt into the case (and not all over the floor). All you need is a Post-it. Still getting a whiff of last week’s fish dinner? To get rid of bad odors (and keep things smelling nice and clean), fill a small bowl with coffee grounds and place it on a refrigerator shelf. Replace every couple of months.